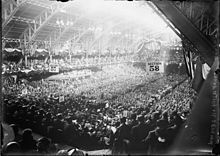 The 1912 National Convention of the Republican Party of the United States was held at the Chicago Coliseum, Chicago, Illinois, from June 18 to June 22, 1912. The party nominated President William H. Taft and Vice President James S. Sherman for re-election. Sherman died days before the election, and was replaced as Republican vice-presidential nominee by Nicholas M. Butler of New York. This convention marked the beginning of a split in the party, resulting from a power struggle between incumbent Taft and former president Theodore Roosevelt. This was the first year for Republican primaries. Though Roosevelt had endorsed Taft as his successor, Taft's perceived drift to the right had alienated Roosevelt, who launched a challenge to Taft's re-nomination. Roosevelt overwhelmingly won the primaries — winning 9 out of 12 states (8 by landslide margins). Taft won only the state of Massachusetts (by a small margin); he even lost his home state of Ohio to Roosevelt. Senator Robert M. La Follette Sr., a reformer, won two states. Through the primaries, Senator La Follette won a total of 36 delegates; President Taft won 48 delegates; and Roosevelt won 278 delegates. However 36 states did not hold primaries, but instead selected delegates via state conventions. Entering the convention, the Roosevelt and Taft forces seemed evenly matched, and a compromise candidate seemed possible. The Taft and Roosevelt camps engaged in a fight for the delegations of various states, with Taft emerging victorious, and Roosevelt claiming that several delegations were fraudulently seated because of the machinations of conservative party leaders including William Barnes Jr. and Boies Penrose. Following the seating of the anti-Roosevelt delegations, California Governor Hiram Johnson proclaimed that progressives would form a new party to nominate Roosevelt. Though many of Roosevelt's delegates remained at the convention, most refused to take part in the presidential ballot in protest of the contested delegates. Roosevelt ultimately ran a third party campaign as part of the Progressive Party (nicknamed the "Bull Moose Party"). Taft and Roosevelt both lost the 1912 election to the Democratic nominee, Woodrow Wilson. Like Taft, Vice President James S. Sherman of New York was renominated by the party. Though Taft and Sherman did not get along early in their tenure, the two became closer allies as Taft's split with Roosevelt deepened, and Taft did not object to the re-nomination of Sherman. 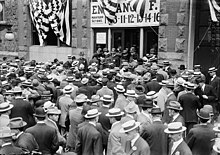 Taft's allies sought progressive leaders such as Idaho Senator William E. Borah and Vermont Governor John A. Mead to join the ticket, but both declined to be considered. Missouri Governor Herbert S. Hadley and former Vice President Charles Fairbanks were also mentioned as possibilities. Sherman died shortly before the election, and was not replaced on the ticket. In January, after the election had already been decided, Republican leaders appointed Columbia University president Nicholas Butler to fill out the ticket for the purposes of receiving electoral votes. ^ "Taft Victory in the First Clash; Root Chosen Chairman, 558 to 502". The New York Times. 19 June 1912. Retrieved 8 October 2015. ^ a b "Roosevelt, Beaten, to Bolt Today; Gives the Word in Early Morning; Taft's Nomination Seems Assured". The New York Times. 20 June 1912. Retrieved 8 October 2015. ^ "Taft Renominated by the Republican Convention; Roosevelt Named as Candidate by Bolters". The New York Times. 23 June 1912. Retrieved 8 October 2015. ^ a b c d "Plan is to Nominate Taft Tonight; Roosevelt Orders Name Withheld; He Shifts on Third Party Plans". The New York Times. 22 June 1912. Retrieved 8 October 2015. ^ a b "James S. Sherman, 27th Vice President (1909-1912)". US Senate. US Senate. Retrieved 9 October 2015. ^ "Taft Is Nominated On First Ballot". Santa Cruz News. Santa Cruz, CA. June 22, 1912. Retrieved January 7, 2018. ^ "Taft Wins With 561". The Courier. Harrisburg, PA. June 23, 1912. Retrieved January 7, 2018. ^ Pietrusza, David (2007). 1920: The Year of the Six Presidents. New York: Carroll & Graf. ISBN 0-7867-1622-3. ^ "Vote That Renominated President Taft". The New York Times. New York, NY. June 23, 1912. Retrieved January 7, 2018. "Bull Moose years: Who Won the Presidential Primaries in 1912?". William Jennings Bryan, Virgil V. McNitt. A Tale of Two Conventions. Funk & Wagnalls Company, 1912. This page was last edited on 4 January 2019, at 18:52 (UTC).